Lawrence Demetric Johnson was born on 14 March 1969, in Tyler, Texas, USA. He is a retired basketball player, best known for playing in the National Basketball Association (NBA) for the Charlotte Hornets and New York Knicks. He played the power forward position and was considered one of the strongest players in that position during his time. The success he had in the sport has helped raise his net worth to where it is now. How rich is Larry Johnson? As of early-2016, sources estimate that his net worth is at $10 million, mostly acquired through a successful career in basketball. Prior to the NBA, Larry was also successful in college basketball. After retirement, he continues to work for the NBA, and has also been cast in roles in film and on television that have helped raise his wealth. Johnson’s basketball career started in Odessa College. During his two years there he was awarded the National Junior College Athletic Association Division 1 Player of the Year award twice. He then transferred to the University of Nevada, Las Vegas and helped the team win the 1990 NCAA Men’s Division I Basketball Tournament. The team went on to achieve a perfect 27-0 regular season record the following year, but was eliminated in the 1991 championship by Duke. Larry won the Big West Conference Player of the Year Award, the John R. Wooden Award and the Naismith College Player of the Year Award. In the 1991 NBA Draft, Larry was selected as the first overall pick by the Charlotte Hornets. He won the Rookie of the Year Award, and went on to compete in the Slam Dunk contest the following year. In 1993, Johnson became the first Hornet to become a part of an All-Star Game. 1993 was the best year for Larry statistically and he went on to get the nickname “Grandmama”, from his participation in certain advertisements. He then signed a 12-year $84 million contract deal which was the most lucrative contract in the NBA during that time. However, he missed most of the next season due to an injury and came back to compete in the 1994 FIBA Championship. By 1995, he was once again invited to become a part of the All-Star game thanks to his performance. Due to friction between him and Alonzo Mourning, the team then decided to trade both players to various teams. His net worth didn’t suffer. Johnson had his career lows when he became a part of the New York Knicks, being more of a contributor than a star in the next few seasons. In 2001, Johnson retired early due to chronic back problems which affected his performance. 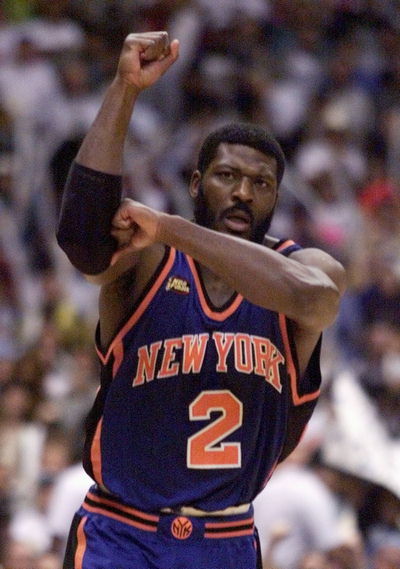 After retirement, Johnson completed his degree in social studies from UNLV, and then became a business and basketball representative for the Knicks. Aside from basketball, Johnson has had a chance to appear in various film and television productions. He was part of the show “Family Matters” as Grandmama, and he appeared as a guest in the “Late Show with David Letterman”. He was also part of the Michael Jordan movie “Space Jam”. For his personal life, Larry Johnson has been married to Celeste since 1994, and they have a son. It is known that Larry converted to Islam sometime during his career. He even observes Ramadan, the month of fasting, and endured it while the NBA season was ongoing. 2 (1996-) Foward for the New York Knicks. 3 Charlotte Hornets All-Time Free Throws Attempted Leader (1,962). 4 Charlotte Hornets All-Time Free Throws Leader (1,513). 5 Charlotte Hornets All-Time Rebounds Leader (3,479). 6 Charlotte Hornets All-Time Defensive Rebounds Leader (2,293). 7 Charlotte Hornets All-Time Offensive Rebounds Leader (1,186). 8 Forward for Charlotte Hornets (1991-1996) and New York Knicks (1996-2001). 9 1st overall draft pick in 1991 NBA Draft. 10 1992 NBA Rookie of the Year. Charlotte's all-time leading rebounder with 3,479. Traded by Charlotte to the New York Knicks for Anthony Mason and Brad Lohaus on 7/14/96. What’s Journalist Fiona Bruce’s Net Worth? Who’s her husband & What’s her age?